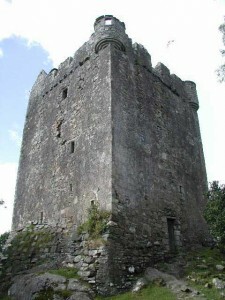 The Moy Castle Stabilisation Project has been supported by a grant from the Heritage Lottery Fund. Thanks to National Lottery players, we have been able to undertake work on Moy Castle that will go a long way to protecting it for the foreseeable future. To help us keep Moy Castle safe for the long term see the donation link below. 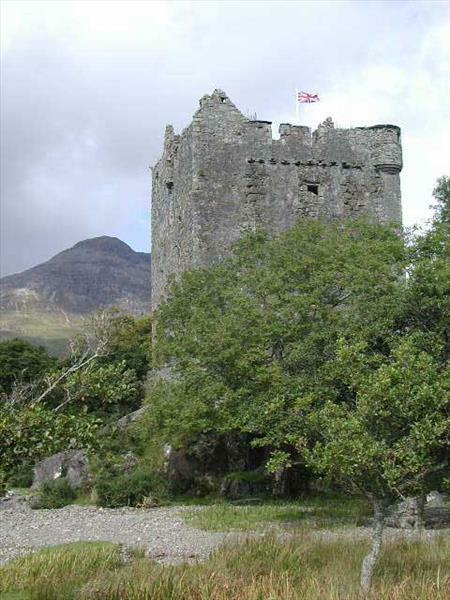 Moy Castle, an imposing tower house, stands on a low rock platform at the head of Loch Buie. It was built in the 15th century by Hector MacLean, brother of Maclean of Duart and the founder of the re-named MacLaines of Lochbuie, who made it their home. Moy Castle was built as a home for the Maclaines of Lochbuie. Clan Chief Lochbuie was forced to surrender the castle to the Earl of Argyll in 1690 due to his involvement in the Jacobite rising of 1689, but the castle was restored to the Chief in 1697. It was abandoned as a residence in 1752 when Moy House was built and later the current Lochbuie House. The building materials of the original castle are schistose slabs, quarried from nearby Laggan, harled stone, and beach boulders, all laid with lime mortar. Quoins and margins to all openings are fine-grained sandstone of a greenish colour quarried at Carsaig on the Ross of Mull. Large blocks of slate paving for the parapet-walk were probably quarried from Ballachulish or Easdale. It is a three-storey tower with a garret. The two main chambers on the ground and first floors have cross barrel-vaulted roofs, a unique feature of Moy. The vaulting on the first floor runs in the opposite direction from that of the ground floor. In the centre of the ground floor there is a well with a depth of 1.8 m. The well is cut into the solid rock, but always has fresh water in it and is at a level much above the outside ground level. There is currently no knowledge of the means of water supply to this well. The main first floor has an impressive barrel-vaulted chamber, which probably served as the main hall in the original arrangement. At the north-east end of the hall there appears to be a raised platform or dais. The hall is served by two original mural chambers in the diagonally opposed east and west corners. There is a garderobe and latrine chute still visible on the south-west wall. Near the angle formed by the limbs of the chamber is a hatch providing the only access to a well-constructed pit-prison or bottle-dungeon, 3.3 m in depth and 1.2 m square at the base, with tapering side walls and corbelled at the neck. Spiral stone stairs and a short, lintelled passage lead from the stairs to a long narrow apartment formed within the thickness of the south-east wall. This was perhaps intended as a bed chamber, though some historians claim it was used to hold the dead during funeral obsequies. The second level rooms are reached through a fine original doorway with pointed arched head composed of four voussoirs (the wedge-shaped or tapered stones used to construct an arch) and the dressed surround uniformly wrought with a broad chamfer. The next two stories had floors of wood, though the walls are 2.2 m thick. Externally, the most interesting features are the upper works of the tower where the parapet is embattled with broad merlons (the solid part of a crenellated parapet between two embrasures) and crenelles of deep and narrow proportions. Each turret is provided with small windows and smaller square openings, possibly firing apertures. A steeply raked loop with double aperture at the base protects the entrance to the castle. The entrance door is locked at the moment because of a risk of crumbling masonry. In September 2006 renovation work to stabilise the interior and external stonework was begun and completed in late summer 2013. A further tranche of work, including the installation of handrails and covers to the dungeon and well was completed in 2015. This leaves the final phase of repairs to the door area, entrance area and stabilisation of the elevations below the buttresses to be undertaken. Even though free access is not permitted to the castle for safety reasons, it is still worth a visit as it has a commanding view over Loch Buie. To find out more about the work that has been done on Moy Castle click on the following links: how we replaced the crumbling medieval drains, the new lead drain spouts, how we went about recording the work and the castle within its landscape, the beautiful new hand-rail which protects people on the wall-walks and the new roof over the staircase. You can also see and read about what we are doing to future-proof Moy Castle.